Happy Sunday! And it's actually a happy one for once because I have tomorrow off! The joys of working for the government folks. 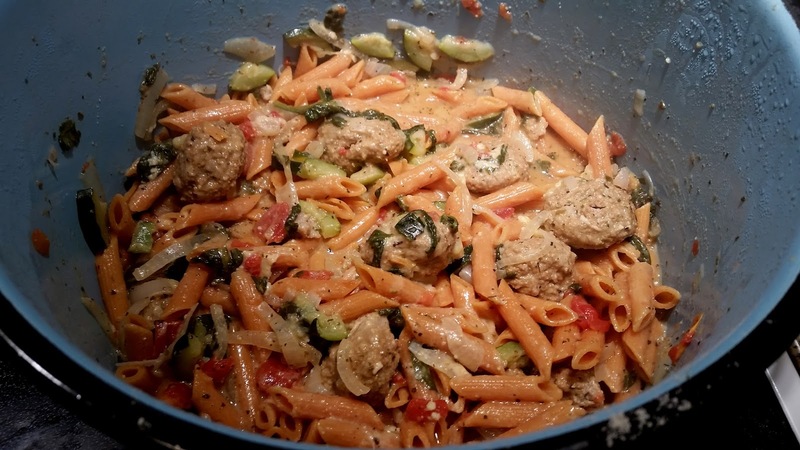 Today I thought I would share one of my "expirimental" recipes based loosely on all the One-Pot Pasta Dishes we've been seeing floating around the Pinteresphere. I was going off this one from Damn Delicious for a general idea of how to get 'er done. I adapted quite a bit from there though. 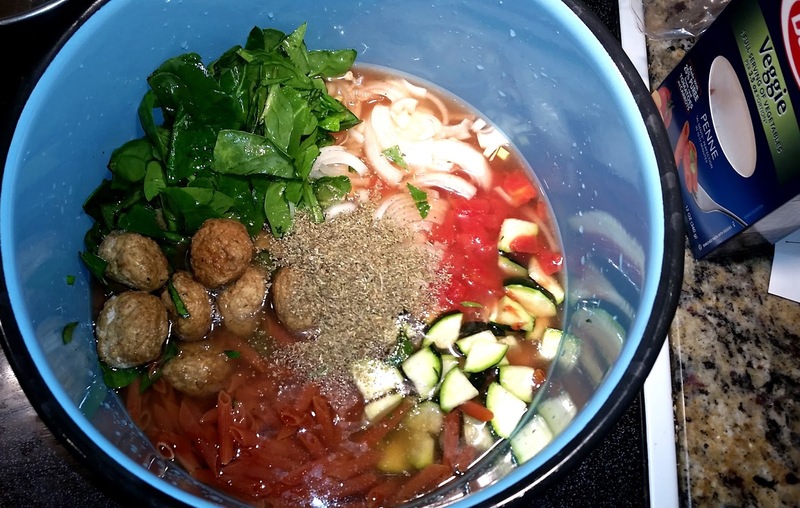 Like swapping sausage for meatballs, and loading it with extra veggies like zucchini, spinach and even veggie rich noodles! The beauty of this dish? Beyond the colors I mean? One pot clean up. Easy peasy. 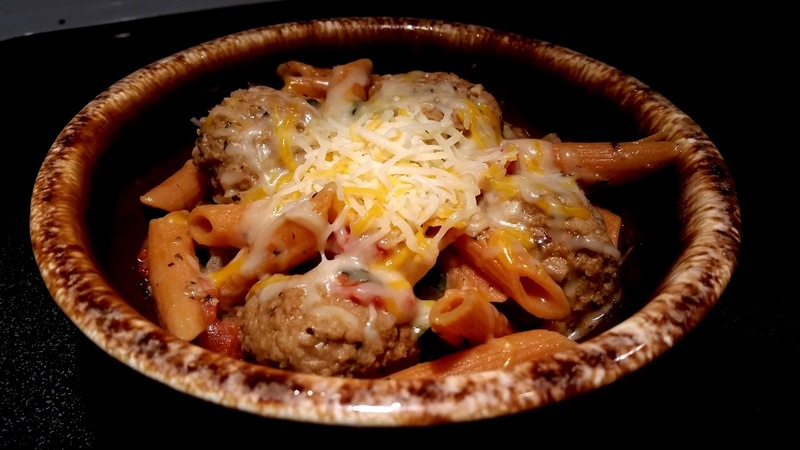 Add all ingredients except cheeses to a large stock pot or Dutch oven. Bring to boil. 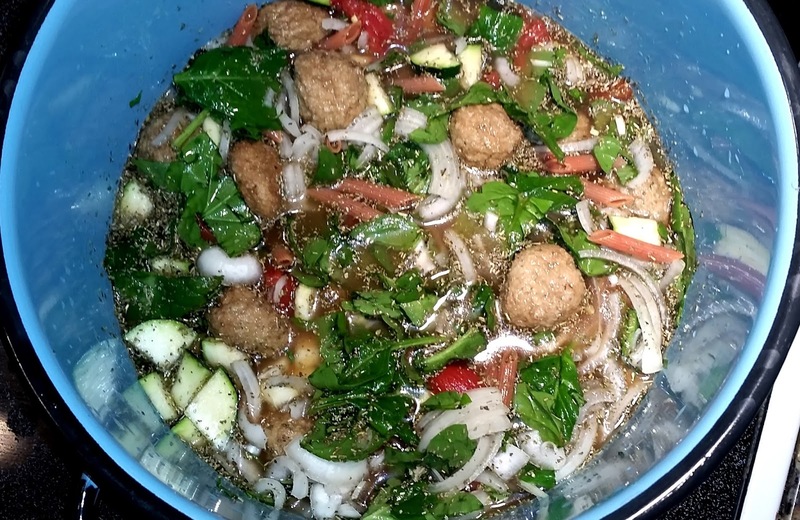 Then reduce heat and simmer 10-15 minutes until noodles are tender, veggies are cooked and meatballs are heated through. If necessary, drain excess liquid, but leave a little reserved in pot. Add Parmesan cheese and stir to create sauce. Dish into bowls and serve immediately. Top with shredded cheese if desired. Have you tried one-pot pasta? If you try this let me know what you think! I tried a one-pot pasta a few months ago and unless it was what I put in it or something it did not turn out so good :( But yours looks super good!! This looks delicious!!! 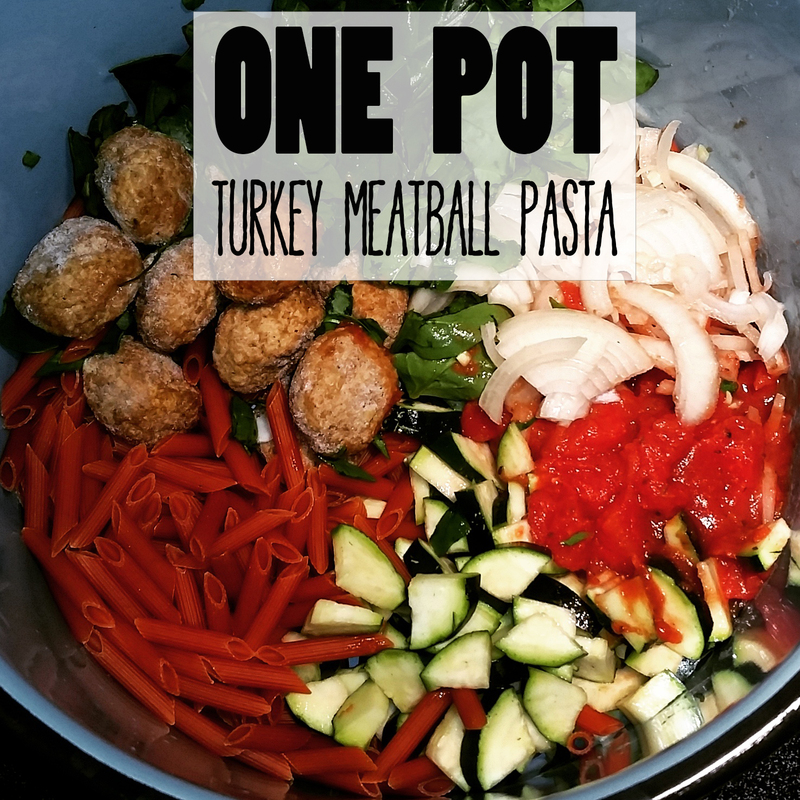 I love one pot meals, easy clean up for the win! Definitely pinning this! Doubt my husband will eat it because he's picky, but my daughter will love it!! Looks delicious! one pot meals are the best. I want this right this moment. Right now. Waiting for me when I get home. This sounds delicious! In fact, I think I may have just found our dinner for tonight. Thanks for sharing! Holy ghost this looks amazing. I'm gonna have to bookmark this one. OMG my mouth is watering haha. That looks amazing. 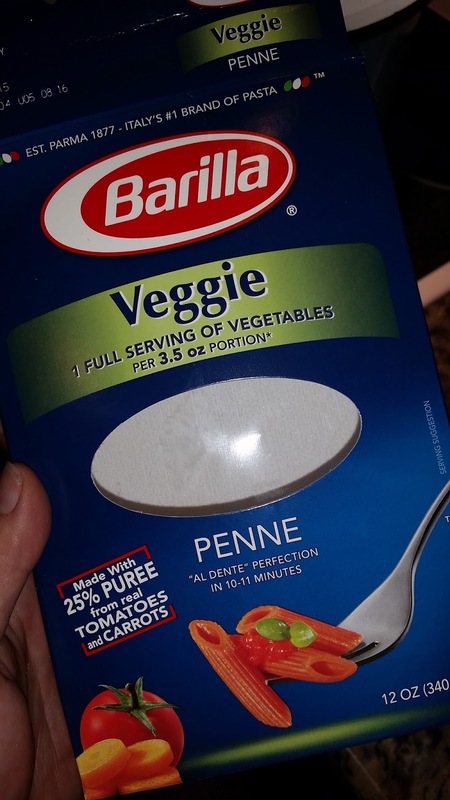 I love loading in all the veggies possible. And I also love one pot meals. I get so upset when a recipe says it's a one-pot meal but you have to brown something, transfer it to a plate, and keep cooking in the same pot. That is two vessels! !